Fewer than 50 Syrian refugees have been admitted into the United States to seek protection through resettlement during the current fiscal year, which started Oct. 1, the agency noted. Ahead of World Refugee Day June 20, JRS has initiated a petition campaign urging the Trump Administration “to admit more refugees into the U.S. and to support funding for humanitarian assistance for refugees, in particular for the education of Syrian children,” Sarah Carroll, the agency’s communications director, told Catholic News Service. The United Nations has warned of a “lost generation” as an estimated 1 million Syrian children are missing education. Before the start of the conflict in 2011, Syria had one of the highest literacy rates in the Middle East. The U.N. also warned it will have to cut services to refugees unless the international community quickly provides the funds it promised. The Washington-based JRS is an international Catholic organization that aids refugees, forcibly displaced people and asylum seekers worldwide. Regarding the Syrian crisis, JRS assists displaced Syrians inside the war-torn country with education programs and hot meals, Carroll said. It provides food, shelter, education and psycho-social support to Syrian refugees in Jordan and Lebanon. In Europe, particularly Greece, it offers legal services to refugees seeking resettlement or temporary protection. “Wherever there are Syrian refugees, we feel very strongly that even though we are eight years now into this conflict, we must still pay attention to this really in-need population of displaced people,” Carroll said. In Lebanon, the agency provides education for children as well as catch-up studies in Beirut and in Syrian-built informal camps in the Bekaa Valley, explained Jesuit Father Nawras Sammour, JRS Mideast regional director. “We are serving 4,000 children in Lebanon now. But Lebanon is housing some 300,000 children unable to go to school because a lack of money and school buildings. This is a huge problem,” he said. 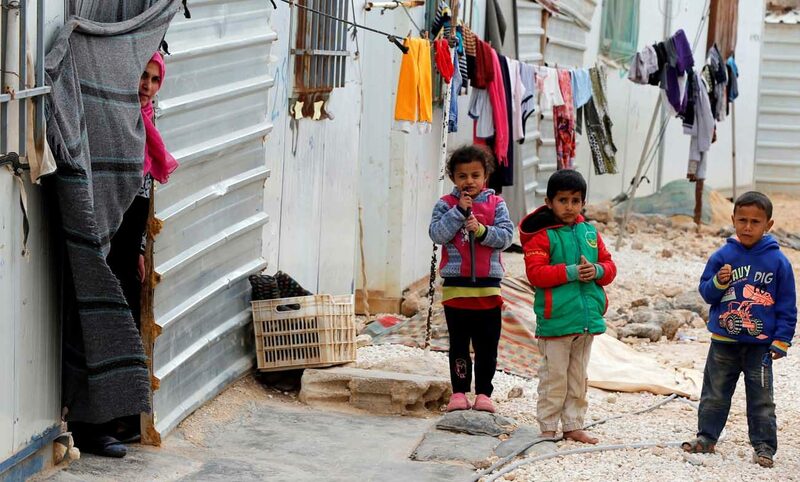 “We still have 70 percent of Syrian refugee children in Lebanon who are not served. If there is a generation lost, it would be that generation for sure,” he said. In Jordan, the agency provides post-secondary studies to help refugees develop English language skills and post-traumatic stress training for social workers and educators who work with young people. With violence continuing in the country, about 10,000 Syrians flee their homeland daily, according to JRS. Pope Francis recently highlighted that some of the most violent periods in the long Syrian conflict have occurred in recent months. “All of this is inhumane, one cannot fight evil with another evil,” he declared. More than 500,000 Syrians have been killed so far in the war. JRS officials have maintained that although there continues to be bipartisan support on in the U.S. Congress for a robust level of humanitarian assistance for Syrians displaced by the conflict, President Donald Trump’s budget request for fiscal year 2019 proposed significant cuts to international aid. The White House has said the cuts are necessary to reduce the federal deficit and bring spending in line with the administration’s priorities. Meanwhile, U.N. humanitarian agencies warned May 31 in Amman that food, health and education aid for Syrian refugees and the displaced would be cut unless donor countries make good on pledges totaling $5.6 billion. “The only solution we have is to stay the course and provide humanitarian assistance,” Amin Awad, U.N. Syrian humanitarian coordinator, told CNS. Awad called the humanitarian situation in Syria “critical,” saying that 28 percent of the funding commitments made by governments in Brussels in April had so far been received by early June. “We are already falling behind in providing cash assistance, in making sure we are picking up health bills, in supporting governments and municipalities to continue to give services to refugees,” he said.